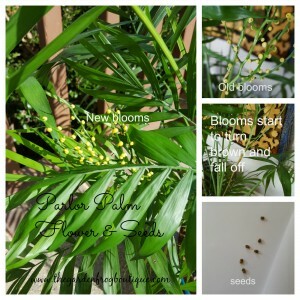 Parlor Palm (Chamaedorea elegans)(Neanthe bella) is an easy to care for house plant that will grow in low light conditions in your home or office and in the shade and humidity of summer. I was given a scrawny Parlor Palm that my girl friend had about a year and a half ago that she had been growing in the same pot for years. The Palm was not happy and so I agreed to take it home. I have a lot of windows but not a lot of sunlight. I live under 13 Oak trees so in the summer the plants all go outside on the deck under a gazebo or in my potting area in the dappled shade. If you want to see a plant grow, put them outside in the right conditions and they will grow-fast. I had never grown a Palm before because I thought they required a lot of humidity (which they prefer) and they just never really appealed to me. However, I cannot pass up a free plant especially one that comes from a friend. Last summer the Palm sat in the shade back by my potting area from March-November. All my house plants stay outside until the temps dip to 40s consistently at night because many plants need the chill for winter time blooms. The Palm tripled in size from October 2014 through November 2015. In December (2015) I noticed funny stems emerging from the fronds and panicked that something was wrong (like a weed growing in the pot). I had no idea Palm trees bloomed. Now I have been growing house plants for as long as I can remember and I have found that the experts are not always 100%. I discovered this winter through experimentation with fertilizing that my Parlor Palms developed 2 stems filled with blooms. 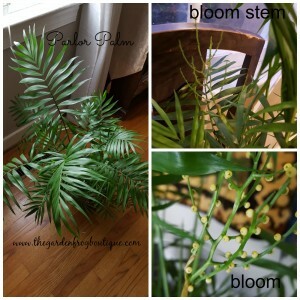 One stem started to bloom in January and in February the 2nd stem ‘bloomed’. These are very insignificant blooms but they are blooms! There are seeds and the experts say they are not fertile (I think I will try to germinate them and see). How did I get it to bloom? Fertilizing with diluted fertilizer once a week, put in an East Window, and watered every couple days with rain water and made sure it never dried out (but stayed moist). In the winter my home is at 65 degrees and my houseplants seem to thrive at this temperature. I also think growing outside during the peak hours of spring, summer, and early fall triggered the fern to grow and bloom. I am about to admit that my Parlor Palm also sat on a chair on top of my heat vent too which is for most plant people is a no no. 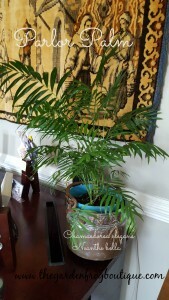 However, it never bothered my Palm tree as long as I kept it watered and fertilized. I will keep the Palm in the same pot until it is too top heavy for the pot because I found out these palms have a weak root system and love to be pot (root) bound. Parlor Palm might also be sold under the names Chamaedorea elegans or Neanthe bella. I have searched for the differences and have found none. It is a commonly sold house plant and is one plant that you do not prune. 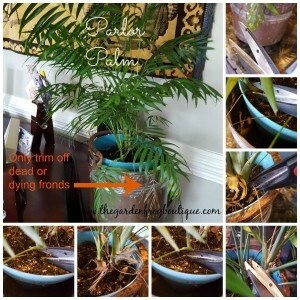 The only time you take scissors or pruners to the Parlor Palm is when a leaf turns brown or yellows and when the blooms are spent. The Parlor Palm grows from the terminal bud or the main stem of the plant which can cause the plant to stop growing. No worries because the Parlor Palm is not a house plant that will take over the house any time soon with heights reaching anywhere from 2-4′ depending upon the variety. Bugs. We have to talk about bugs on your Parlor Palm (or any other house plant). Palms are notorious for attracting spider mites which can lay and hatch within days. Believe me when I say that you have to keep vigilant about bugs on your plants because even experienced plant lovers can get bugs. Many times a gentle shower with Dawn (or Ivory) to kill the bugs and a gentle rinse to wash away the remains will work. I also now use more natural and organic methods like Neem Oil. Thanks for stopping by. If you ever have any questions, feel free to contact me.